Only $125.00 each ( Much lower than its original price during the 1970s ) Buy two and you get a Silver Dollar with values up to $80 each when buying two. Example: Type 2315 front load disk cartridges IBM 1130 systems. It evolved over the years since it proved to be a great cost performer for removeable disk storage. You get all the specs and tech sheets with this buy. ray-tapajna-artistwebsites.com You can order directly from this site. Note too the Control Data Front Load Disk Cartrdiges which were one of the first disk storage devices for computers. 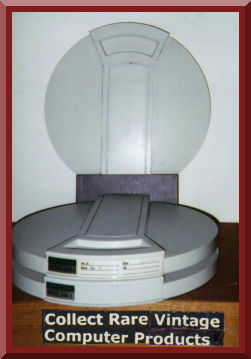 Rare collectible vintage computer products -compare how rare they are. http://ray-tapajna-info.net/collect-vintage-computer-products/id13.html They represent a quality that is very difficult to find in our present times. Plus Free limited edition art prints of Babe Ruth and Joe DiMaggio with buys of more than $100 - see bottom of page. The best way to introduce you to our collectible computer products is to tell you our story. 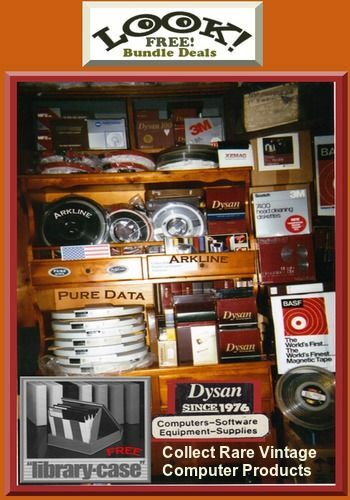 In 1976, a new cat scan manufacturer called us for help about their disk storage problems. They were ready to start shipping their new cat scan system when they found they could not find the proper disk storage devices for their cat scan systems. They needed 100 percent error free disk devices which at that time were not available anywhere. They were also "crashing" the disk packs they were trying to use. At that time, I was with an international disk and tape manufacturer and knew this manufacturer was not able to provide the product they required. We heard about Dysan Corporation who was deep into disk storage testing and certification devices. We got in touch with them and they said they were just getting into producing disk storage devices and knew they could provide us with 100 percent error free total surface tested disk packs. Up to this time the best disk storage devices had about 60 correctable errors made by Control Data Corporation. We began supplying the cat scan manufacturer with Dysan disk storage devices and filled the need for the new cat scan manufacturer and other manufacturers like GE Medical System. We found ourselves in a new business as independent representatives nationally for Dysan. We did this for five years and then joined Dysan directly. In the end had an association with Dysan for ten years. Later, we became trouble shooter supplyer to major corporations with free trade causing many quality issues for many manufacturers in finding components that once were made in the USA. We also devised new burnishing and lubrication methods for computer tape. We knew the difference between what is called magnetic storage soft and hard formulas. At the same time we introduce our own branded micro computer that were built to our specification and supplied China with special components and calibration devices. We enjoyed continued success until free trade caused us to lose most of our major clients who were forced to close down completely or send their manufacturing process outside of the USA. We also help jump start the computerized typesetting industry based on 100 percent error free 8" hard sectored diskettes which were first made by the Schugart company. Alan Shugart, the president of this company, later became the CEO of Seagate Technology the largest hard disk manufacturer in the world. Dysan help fund Seagate start up. Many of the products here represent the very best technology with many having specs that make them rare. Now you can share in this history when most computers and devices were made in the USA and before free trade came and caused more than a million workers in the computer industry to lose their jobs with hundreds of U.S. computer manufacturers closing down and thousands of computer business suffering the same fate. Now you can collect many of these rare items in new condition in original packaging with a full background of the products. We have many files of technical information that is also available for all who are interested in this information for a minor extra charge.